Only die-hard campers venture under canvas once the weather has turned, right? Braving the wind, the cold and – god forbid – the downpours. Managing expertly not to touch the sides of the tents for fear that the rain will seep through, risking sodden socks by removing muddy wellies outside the tent and remembering to bring hot water bottles for that vital warmth at night, yes? It has to be said, traditional camping in the autumn and winter isn’t always fun, and thoughts of freezing mornings and struggling against strong gusts to get those tent pegs down can put many people off. However, that needn’t be the case anymore. Imagine if you could enjoy space and comfort in a tent that was both warm and dry, no matter what time of year? Where you could swap the one-ring gas burner for a proper stove, allowing you to prepare dishes that didn’t come garnished with grass? Where you could sit on the terrace sipping a glass of wine, while the children slept soundly in their bunkbeds? With glamping, it’s possible to camp in the colder months in your own luxurious, private comfort. As the song (doesn’t quite) say: it may be winter outside, but in your tent, it’s spring. Suffice to say, one of the biggest reasons people don’t consider going camping later in the year, is that the temperatures simply drop too much. With no radiators, it can get pretty cold with just a thin layer of tent between you and the elements. Not so in one of our glamping tents. Each one contains a log-burning stove which is not only an oven, but serves as a heater, warming the entire tent and keeping you all snug. Plus there’s plenty of room to move around and keep warm, so you won’t need to huddle together to share body heat. You can keep toasty while watching the sunset and the stars come out, too. Each of our tents features a fire pit around which you can sit and regale stories, sing campfire songs or tuck into some warming food. What’s more, our thick duvets will ensure that no one is shivering under the sheets at night. Many people’s memories of camping involve bed issues – an unforgiving foam sleep mat which only emphasises the ground’s lumps and bumps, or an inflatable mattress which deflates steadily overnight. That’s not to mention stinky, smelly sleeping bags which somehow absorb all the damp air to become rather uncomfortable. No more will you have to endure such atrocities! Our tents have separate bedrooms, sleeping up to six people and keeping the rain off, no matter whether it’s pouring or howling a gale outside. That means you’ll all wake up feeling refreshed and energised for the day ahead, not groggy and aching – that goes for the littles ones, too. And after the day’s adventures, you’ll be ready to sink into our deep, marshmallowy beds and drift off to sleep – all warm and dry. You won’t need to yell at your fellow campers for trailing mud into the tent and leaving footprints on the sleeping bag or your one warm jumper. 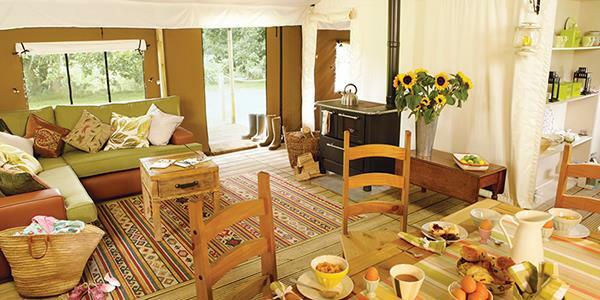 With glamping, there’s room to leave those boots outside – there’s even space to hang up that jumper. It’s quite simply the luxurious alternative to traditional camping. You’ve got a kitchenette, tables and chairs, a generous sofa and a terrace with outdoor furniture. Not to mention a bathroom. No longer is there any need to trudge across wet grass to reach the communal shower block, waiting in line for a free cubicle and shivering on the walk back. Each tent is equipped with a toilet and separate shower room – any seasoned camper will immediately appreciate what a luxury that alone is! Glamping in the colder months allows you and your family or friends to explore the country at its most beautiful: when the leaves are changing colour or when the first frosts glisten across the landscape. It’s a chance for you to enjoy wonderful scenery in a thoroughly comfortable and indulgent way. 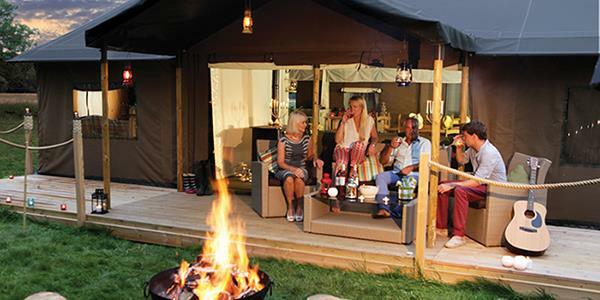 Don’t be put off by these myths of the cold and damp; be bold and glamp! If you would like to check availability or find out more, please call us on 01638 563 478.